Any questions, order requests, or ideas you would like to see made- please use the form @ bottom of page to contact me. Thank you! Special order for a close friend of mine. 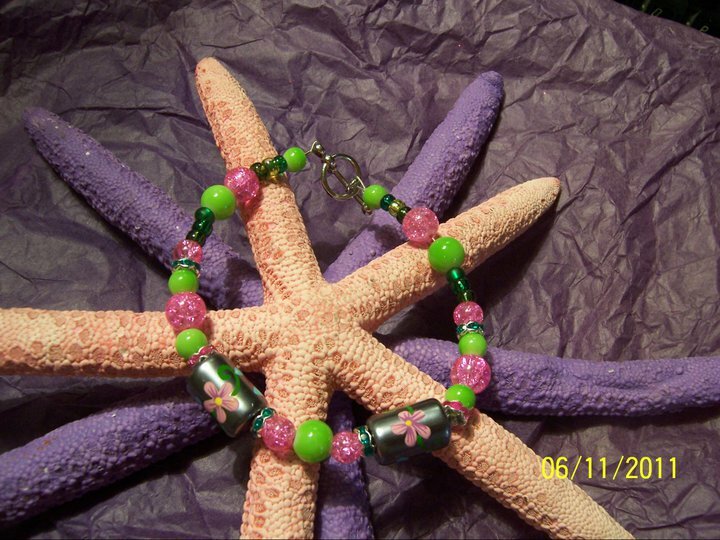 Green/turquoise mixed bracelet & matching anklet. 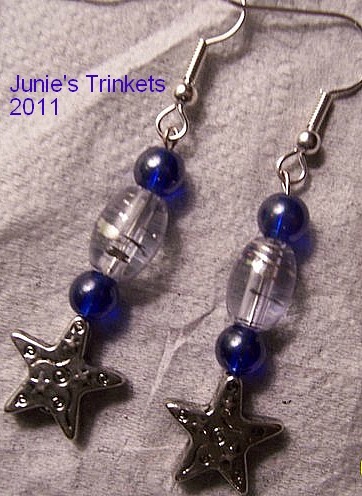 3 pair of earrings made to show different styles in simple drop earrings Most priced $7-$9 depending on what is added. 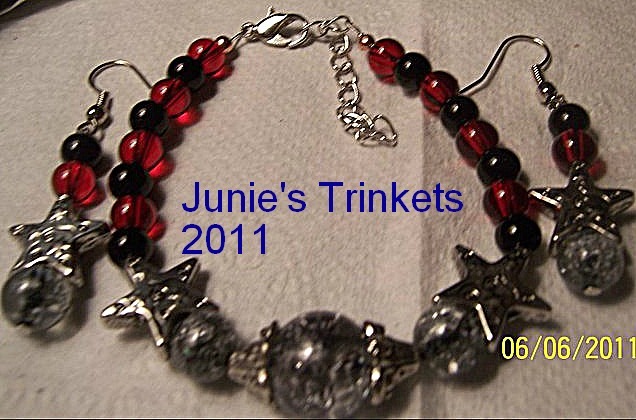 This was a custom order using dark grey crackle glass & swarovski crystals for the birthstones. 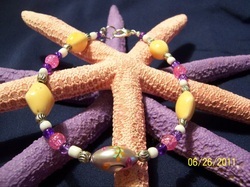 Up to 6 will fit this style & more are possible if only small crackle glass beads are used. This item is sold, but I have a few more crochet flowers like this , as well as some lighter weight ones to make items from in several colors. Some are pictured here on the page. Please use the contact form @ bottom for any questions or orders. Red & black glass beads with dark grey crackle glass beads & silver plated spacers & stars on silver beading wire with silver plated findings. 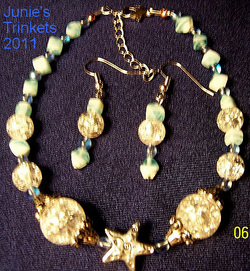 Bracelet & Earring set- Sold but can be made similar to design. 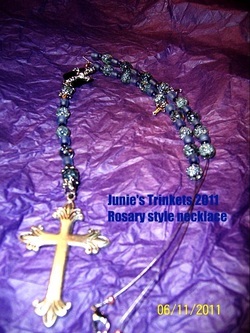 Rosary style necklace this one was dark grey crackle glass & purple glass seed beads with silver plated crosses & findings. 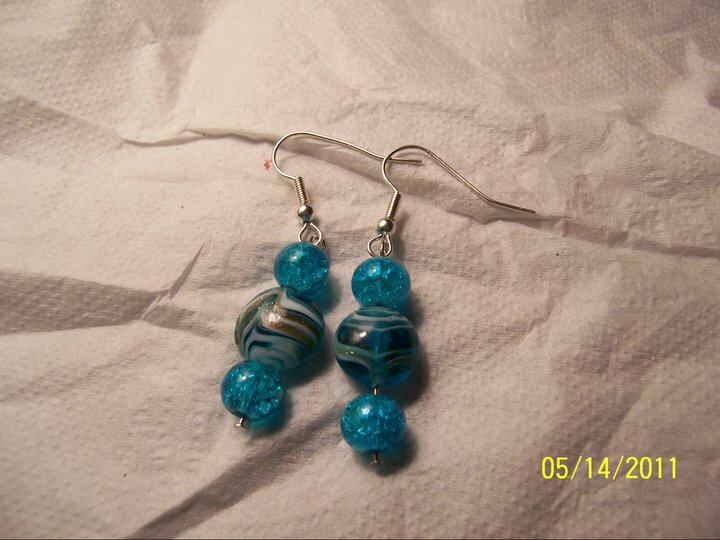 Sold $35- can make them in a variety of colors to suit. 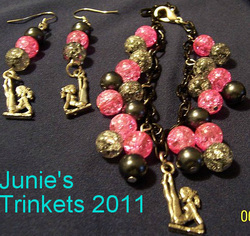 This is another example how earrings can be made to match any bracelet. 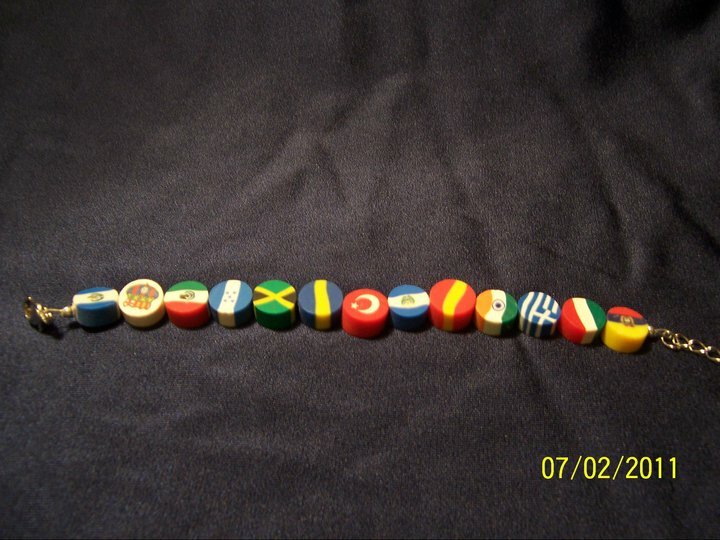 Most sets are $17.50-$20.00 shipped. 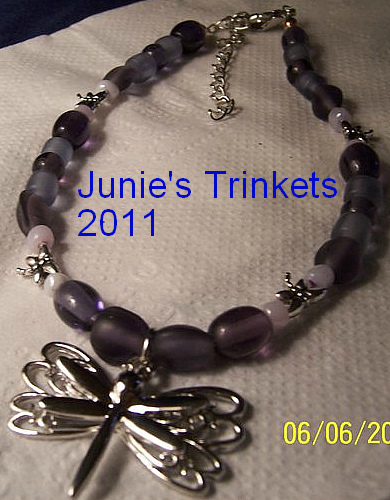 I can also make FULL sets- earrings, bracelet, anklet & necklace if wanted. They can all match or be made to compliment the others. This was a special order set. In those cases I ask that the charms be paid for up front, before I place the order. This was a gymnastics set. 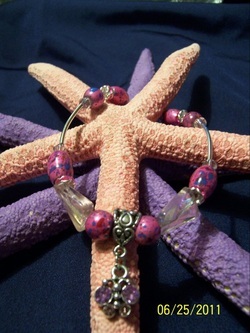 Hot pink & grey crackle glass & jet glass beads on silver head pins attached to a black chain to make the anklet. This set I charged $25 + the cost of the charms. 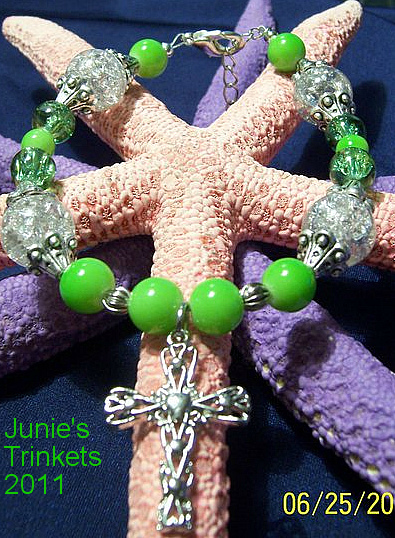 This bracelet is lime green acrylic & lime crackle glass with clear crackle glass, silver spacers - all on silver beading wire, with silver plated findings & a silver plated cross with a heart in center. 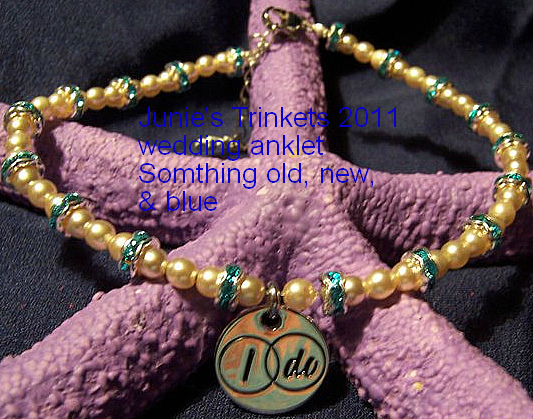 This was a special wedding anklet made for a bride to be in my neighborhood. I was able to incorporate the something old, by repurposing an old pearl choker I found, something new with the pretty silver charm with 2 wedding rings that say "I do", something blue using aquamarine- which is also the bride's birthstone. 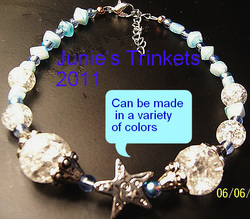 I can make something similar, or use sapphire blue- whatever you wish. 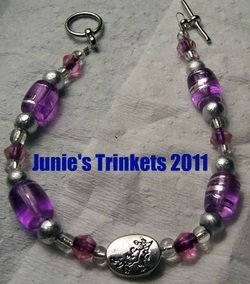 Does not have to be a bridal anklet, but this one was. 600 fan prize. 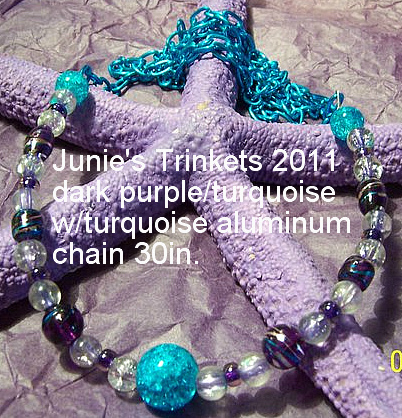 Mixed purples, mostly dark purple w/ turquoise markings & light matte frosted purple glass beads. Pearls used as spacers for the charms flowers & butterflies.Silver beading wire & silver plated findings including a lobster clasp & 2 in extender chain. Reg. Price would be $18.00 shipped. 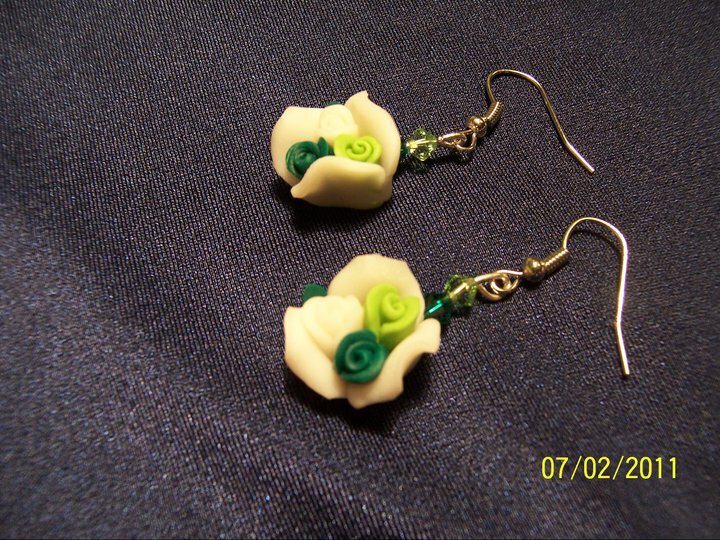 Green howlite wire wrapped in green aluminum wire, in the shape of a flower resting on 2 petals. 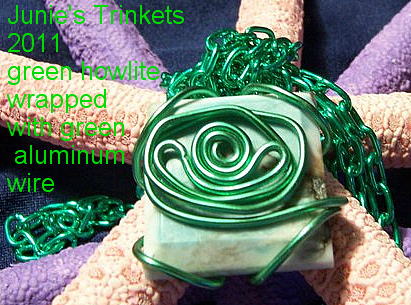 28 inch green aluminum chain included for easy fit over the head. 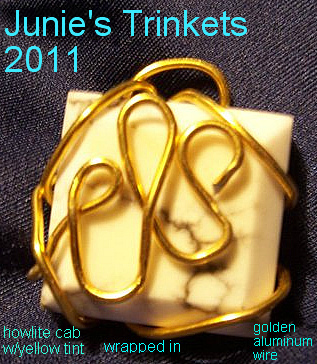 Yellow tint howlite, with yellow golden colored aluminum wire wrapped in a swirl. 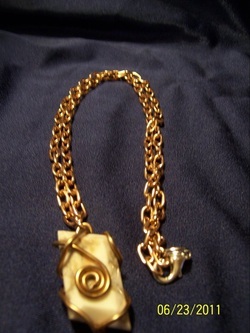 Pendant sold alone or an be suspended on a colored aluminum chain, or silver plated chain for an additional charge. Dark turquoise/rust anklet- larger size! OOAK anklet larger sized. 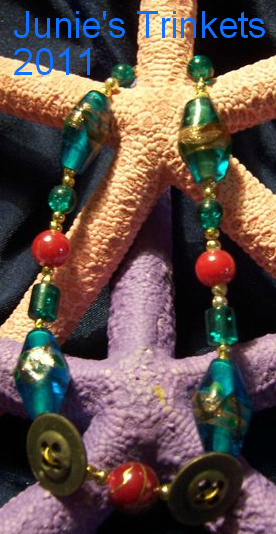 Turquoise,dark green, rust, gold beads - glass, lamp work, & spacers, on gold beading wire. 2 old flat buttons also make this a unique piece. Larger size 9.5 with extender up to 12.5 inches. deep purple & turquoise glass beads, clear purple beads, turquoise crackle glass, & purple seed beads on silver beading wire, then suspended from a turquoise aluminum chain. total 30 inches. Sample Crochet flower bracelets. 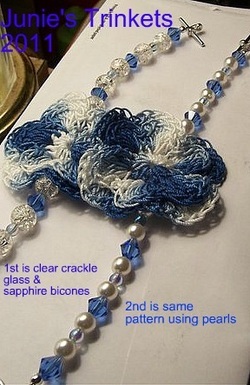 I have to order the crochet flowers, but these are made using sapphire blue bicones, light blue seed beads, & either pearls or clear crackles. 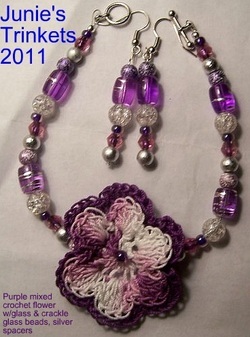 Purple Crochet flower set, made & shipped to Australia. 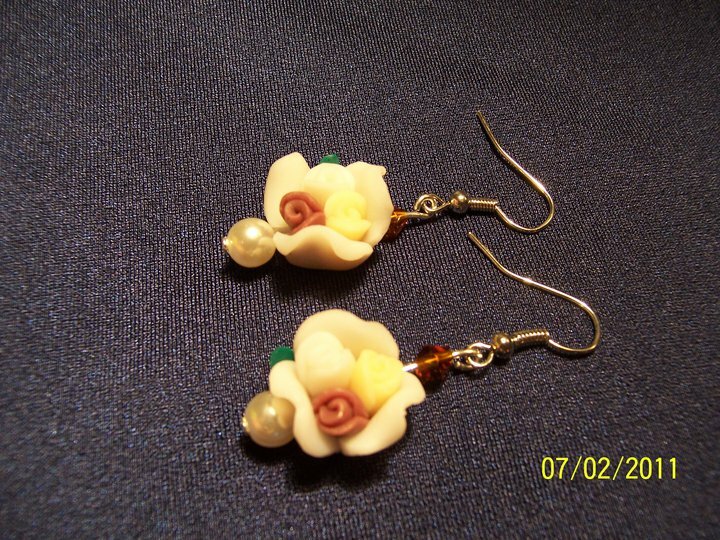 I don't have many of these flowers, & I will have to use different colored beads. But I can make something similar to this. 700 fan prize. yellow colored howlte cabochon with golden colored aluminum wire on a matching aluminum chain. Reg $20 shipped. Each one is a OOAK creation, altho I can make something similar. Prices vary depending on the cabochon chosen. 900 fan prize. 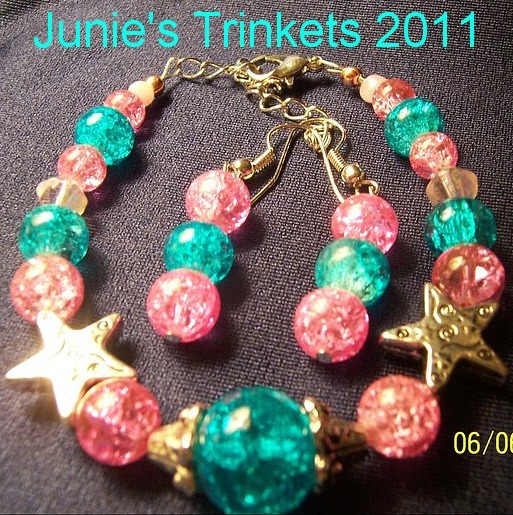 Nice summery anklet. Bright colors for warm weather! 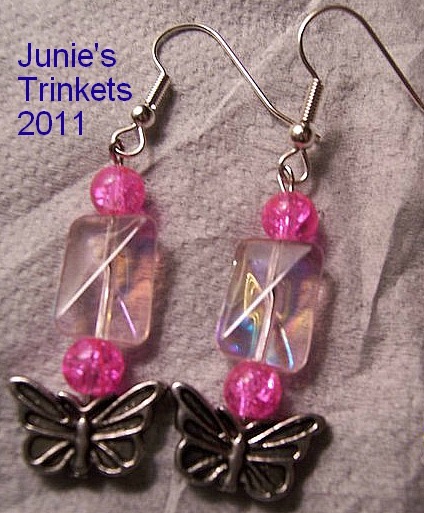 Peaches,pinks, purple, white & silver spacers. Normally would be about $22 shipped. 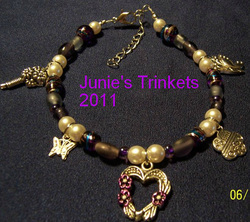 This one is OOAK, as some of the beads are no longer available. 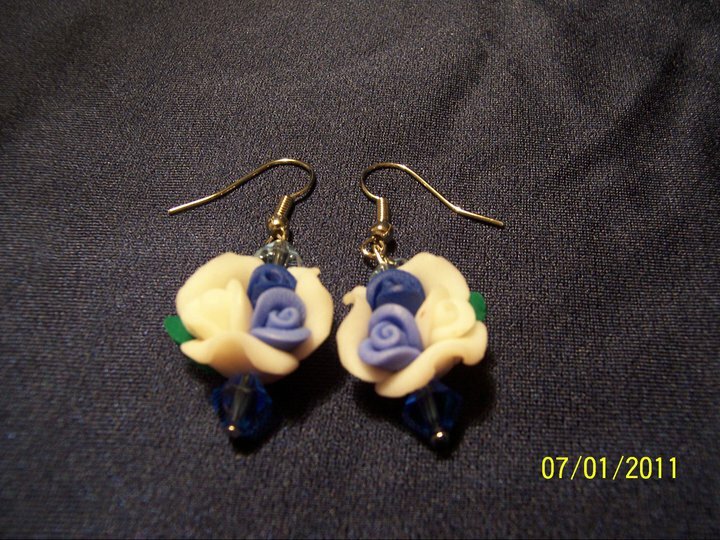 Light/dark blue & cream clay roses with sapphire bicone, & light blue seed beads. SOLD! But I would be happy to make something similar in design. 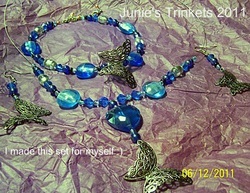 17.5 in necklace, fits up to 19.5in with extender chain. Deep red acrylic beads are complimented with silver spacers, & clear crackle glass rounds. Small silver oval beads with silver spacers between. 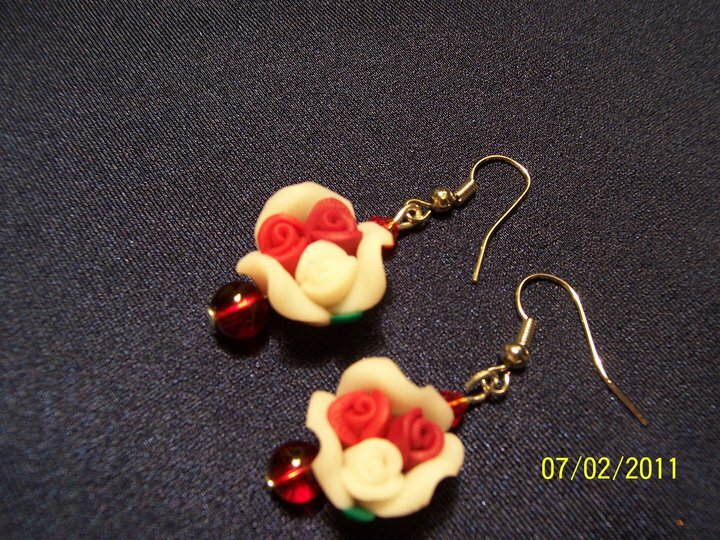 Rosebuds earrings in light/dark red & white with dark reg glass beads & lighter red bicones. 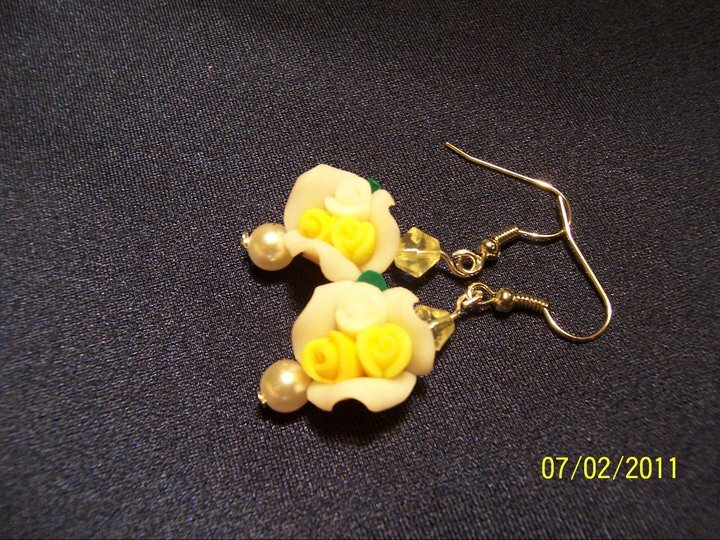 Rosebud earrings with light & slightly darker yellow rosebuds with white. Paired with a white pearl & light yellow bicone. New bracelet. 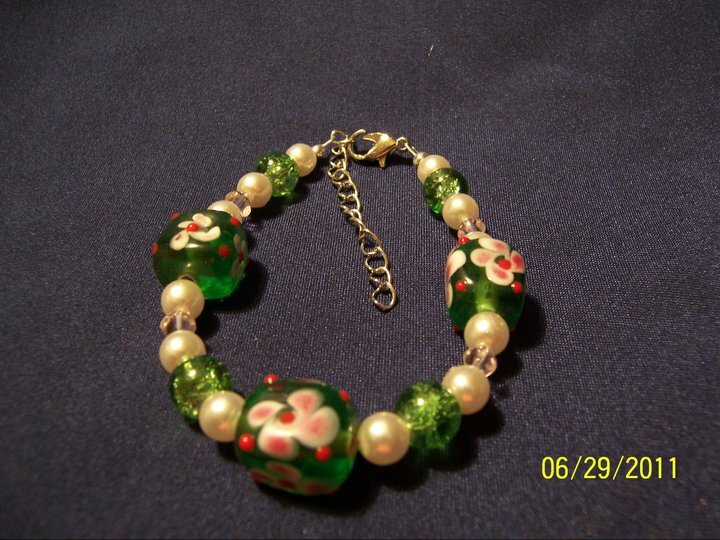 faux pearls, green crackle glass, 4mm light pink bicones, & green llampwork beads w/ light pink flowers & red dots. 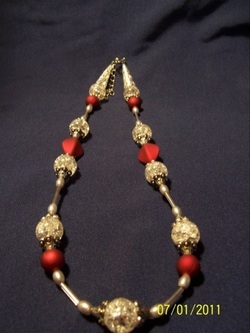 beaded on silver beading wire, with a lobster clasp & 2 inch ext chain. Lightweight Polymer beads on silver beading wire toggle clasp 2 in extention chain. Fits 6-8inches. 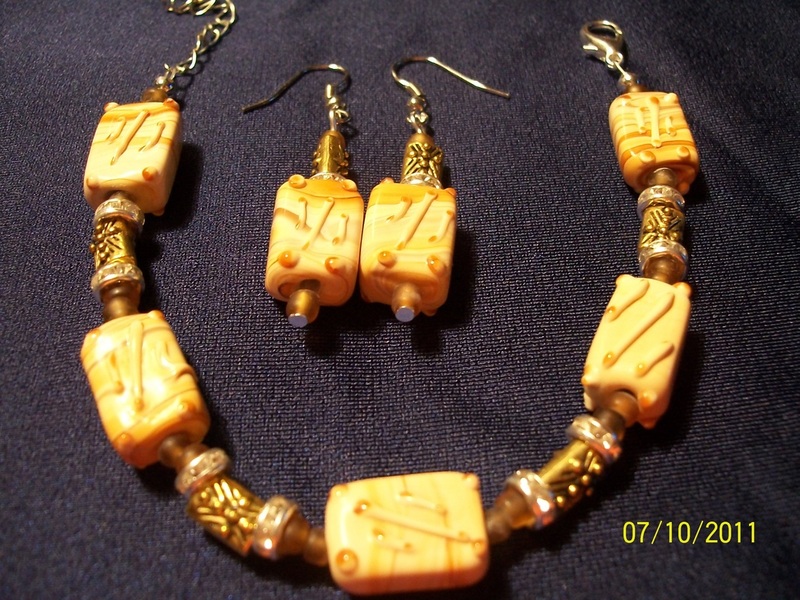 Caramel & cream swirled glass beads with line/dot detail paired with dark caramel seed beads, silver/clear rhinestones & gold colored spacer beads with X & dot pattern on them as well. All on silver beading wire with silver plated lobster clasp, and 2in. extender chain. For any questions, order details, or if you have an idea would like for me to make, please use the form below. Thanks for stopping by, & happy shopping!